Read more about Spoken Word Night Update! Read more about Call for Spoken Word! Presented by Little Blue Moon Theatre. See their website for more information on the October 1st performance. Barbie Diaries 2004 (excerpts from my diary, dramatized by ME.) 2004: I find out Ken has broken up with me (no, He never told me...I read it in the New York Times!) I have a bad period, doing a stint of rehab at the Salvation Army toy bin, then get taken home by a man/artist(?) who likes to play with dollies. I try to make sense of my life, get my first bath in over a year, re-enter the dating game (with disasterous results) and try and pull my life together as a middle aged (but still good looking if you ignore the hair, which I am working on) fashion icon whose best days seem to be behind me. 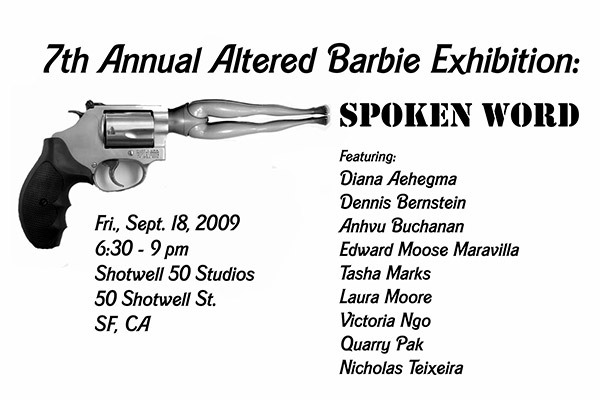 The video is from Lisa Pickoff-White and Rhyen Coombs showcasing "A night with Barbie at the annual San Francisco event showcasing altered Barbies from area artists ". WOW! Who would have thought that, at the age of 62 I would have found something that inspires me so much? And, as a double whammy, that it would involve playing with Barbie dolls, blows me away. All of my life I searched for something to create or produce that would make me feel fulfilled. Well, I produced three children, two boys (now 31 and 41) and a daughter (now 34) and they produced 3 children so far. That fulfills me and now they are grown and on their own. Somewhere along the line I realized that ME, SEARCHING for the thing that I could create was the wrong way to go about it. It's here! a short preview of Sergiu's Breath Video! Read more about It's here! a short preview of Sergiu's Breath Video! 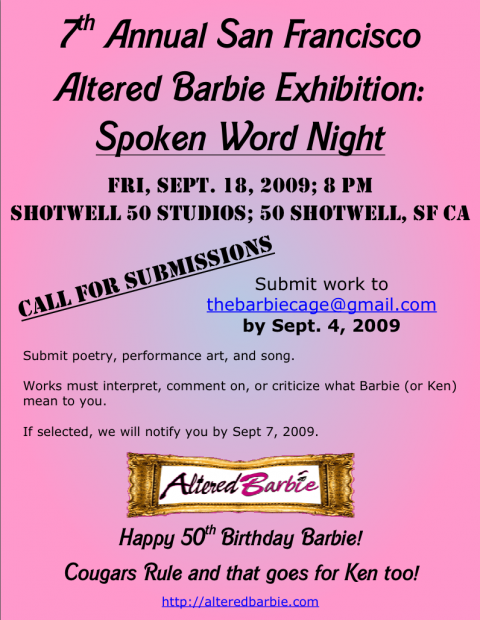 A few notes from Maggie Malloy this years juror for the 6th annual altered Barbie Show: Maggie explains her thought process when jurying a piece for consideration.